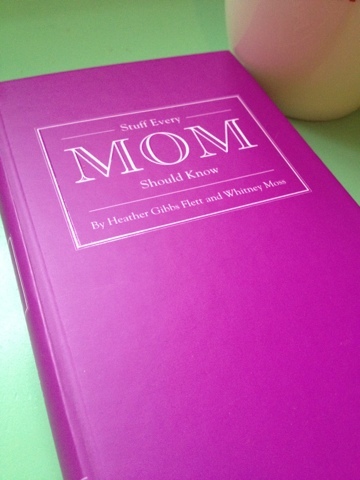 I was recently sent a copy of "Stuff Every Mom Should Know" by Heather Gibbs Flett and Whitney Moss. It's a sweet handbag friendly sized hardback book full of handy tips for all stages of motherhood from Baby to Tween and beyond! The Baby section includes things such as how to swaddle (Baby Origami! ), travelling on an airplane, how to meet other mums and my favourite - Make a Boo-Boo bunny! Little Kid Stuff is full of really great things from photography tips, building blanket forts, getting rid of bedroom monsters, how to raise a good citizen and fun animal facts! One of the sections here is about Potty Training which I'm finding really useful as its something I'm attempting to do with Blake at the moment! I really enjoyed the bit on comebacks for unsolicited parenting advice and halloween costume ideas in the section for Big Kid Stuff and it made me think about things to come when I read the dealing with lice page! The Tween stuff includes tips about keeping them safe online and covert hugs! There was a section on foods they should be able to cook and at the end of the book is a bit about what you should know that the book couldn't tell you! There were a few bits that were quite American such as the section on being a Soccer Mom but I found that the tips were things that could easily transfer to other areas! Its little pages are packed full of helpful ideas and the writers are the ladies behind RookieMoms.com - Overall I thought it was a handy little book and would make quite a sweet little gift for any mums or mums to be! I'm lucky enough to have five copies up for grabs for my lovely readers! If you would like to be in with a chance of winning one, please leave me a comment below telling me what your top parenting tip would be! Please let me know in a separate comment if you have made any bonus entries too so I can count them. Please include a way of contacting you if you win such as @twitterid or an email address. They should give this book to all new mums as they were about to leave hospital after giving birth! My top tip would be: Pick your battles and don't sweat the small stuff especially when entering the terrible 2's. my top tip would be to go with your instincts! Let them watch you brush your teeth from an early age and brush your own teeth alongside them. my tip is to pick your battles with teenagers carefully, as you cant win every one and it sometimes is OK to lose! My top tip would also be to pick your battles! remember how little they really are and if all else fails when they are grouchy, put them in water!